There’s no disguising the fact that uni life is hard, and at least once in your academic career, you’ll probably feel overwhelmed with everything. At this point, a lot of students turn to websites like Pro Dissertation but it’s hard to know whether a service is legit or not. I hope this review will help you figure out if this site is safe to trust, or a scam. When you first log in to prodissertation.co.uk, it seems pretty reassuring, as there’s a live chat window as well as a UK phone number and an email address. However, it’s pretty alarming nowadays for an online business not to have social media profiles, and I couldn’t see a link to Facebook or Twitter. This is concerning, especially if you need customer support or a refund. You have to register for an account before you can enter any order details, which is not a feature I appreciate. If I decide not to use a service, I don’t want to be getting emails from them, and I don’t like being asked to provide details before I can even check out prices or T&Cs.This is really off-putting for me, and I think a lot of other people who like to know what they’re signing up for. A few things were red flags on this website. First, it’s based in the UK, but given prices in dollars, which makes no sense. Second, prices were really high, around $500 for a 3000-word paper. And third, the options for papers were really confusing – it wasn’t a standard selection of essay, thesis, book review etc, so I’m not even sure if I was ordering the right thing. Even if you find a discount or coupon code or promo, this would still be expensive, and a risky deal. 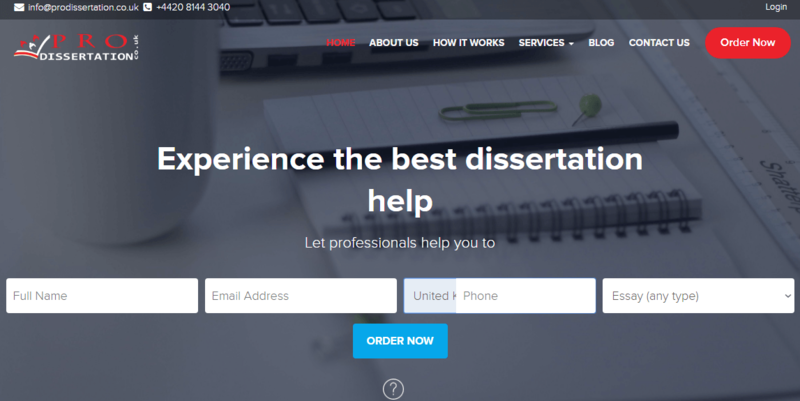 Pro Dissertation claims to only offer quality writing, however, there are no details at all on the background or qualifications of the writers, so I’m not confident that they can really deliver papers that are a high standard. I’d have liked to see an example of a successful paper that was provided, but there weren’t any samples available, or testimonials. When this is linked with the lack of social media, it’s really hard to verify anything this website says. I can’t honestly say that I trust anything about this website, it’s impossible to fact-check their claims, and they’re vague and confused about what they do provide. I’d say to find a straightforward service, that you can check out on social media or read testimonials for.